Juventus started life in their new stadium with a draw against Notts County. The friendly game was preceded by a spectacular opening ceremony, complete with singing, dancing, fireworks, and the now obligatory giant zebras. Many of the good and great linked with the Turin club were present to witness Juventus president, Andrea Agnelli, accept a giant pair of scissors from a woman who looked like Monica Beluucci’s younger, more beautiful sister, and cut the tape that officially opened the stadium. The honour of the becoming first goalscorer at the new ground fell to Italy striker Luca Toni. County’s Lee Hughes spoilt the party by scoring from close range to earn a 1-1 draw. The result though, was academic, with all eyes and ears on the mood within the new stadium. The move was prompted in part by the fans’ failure to embrace the sterile atmosphere at the Stadio delle Alpi. On last night’s evidence, there should be no such fears, with Juve defender Giorgio Chiellini enthusing about the new stadium. “We enjoyed the exhilarating atmosphere provided by the new stadium. It’s been a touching evening, for both the supporters and for all of us. Today’s [Thursday] atmosphere and the warmth of the public were incredible,” Chiellini told the club’s official website. So, a huge improvement on the previous stadium, when by common consensus the best atmosphere produced was when the venue hosted the Italian Grass Growing Scudetto. Juventus will be back at their new ground on Sunday to entertain Parma as the Serie A season gets underway. It’s been a while, but let’s hope it was worth the wait. The start of the new season was delayed by the Serie A strike, but will finally kick off tonight when champions Milan host Lazio. Italian football has had a number of problems to contend with in recent years, and it’s fair to say that they haven’t always dealt with the issues that effectively, but few would argue that European football would be hugely enhanced by the addition of a vibrant Italian presence. With money making opportunities in the old rope trade in severe decline, those of you looking for an easy life could do worse than retraining as a copyright lawyer. In one of the more frivolous court cases of the year, Arsenal have successfully sued the owner of a hat shop in Spain. Seville resident Alicia Simon has been ordered by the Spanish Patent and Trademark Office to change the name of her hat shop ‘Arsenale’. Simon, to her credit, has vowed to contest the decision. “I will fight this to the end,” she insists. If I were her, I’d counter sue Arsenal for the damage they’re doing to her business’s reputation by their performances this season. Junino produced this stunning long-range free kick for Vasca against Coritiba. Older viewers may have been reminded of this effort by Dutchman, Johnny Metgod, for Nottingham Forest against West Ham in 1986. Caretaker Colombia coach Leonel Alvarez has been appointed as the permanent replacement to Hernan Dario Gomez. 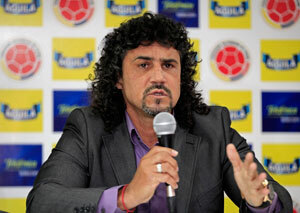 Alvarez sports a glorious mane of hair which confirms the enduring influence of Carlos Valderama on Colombian football. It’s an appearance which looks like it’s come straight out of a Eurovision contender in the 1970s, or any street in Germany in the past week. It never rains but it pours for little Jack Warner. No sooner had the disgraced Caribbean football official been kicked out of the game following his alleged involvement in FIFA’s cash-for-votes scandal, than he loses one of his biggest earners. FIFA don’t do grudges, but if they did, they’d be the Carlsberg of the grudge world. They have terminated a multi-million-pound 2014 World Cup TV deal after discovering the rights had been sub-licensed to a company owned by Warner. FIFA are also owed several payments dating back to 2009 for the rights, which covered 29 Caribbean countries. I think it is safe to say that they are unlikely to ever see that money again. Inter president Massimo Moratti says the team will learn from the mistake that saw them list striker Diego Forlan in their Champions League squad even though he is ineligible to play. Forlan had already represented Atletico Madrid in the qualifying rounds of the Europa League, meaning he won’t be available for Inter until the New Year at the earliest. Checking the rules would be a start. Harry Redknapp has always vehemently denied allegations that he takes a cut of transfer deals, but the frequency with which he is linked with players, makes you wonder if he’s getting a cut from the stories printed about transfer deals. The Tottenham manager has confirmed that he would be interested in signing David Beckham. The LA Galaxy midfielder, who is in the last year of his MLS contract, spent some time training at White Hart Lane earlier this year, and has been linked – by Redknapp at least – with a return. “If David wants to come to Tottenham, I’d welcome him with open arms,” said the Spurs boss. Slight confusion there Harry: although Beckham is paid his weight in gold, he’s not actually worth it. 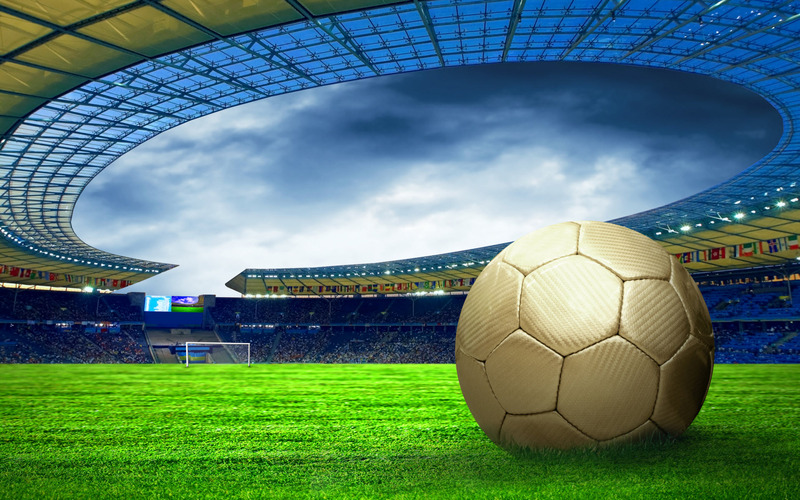 Qatar could invest US$220 billion in its efforts to deliver the 2022 FIFA World Cup, according to a report. German financial adviser Dr Nicola Ritter claims $48 billion will be spent to build air-conditioned stadia, while $77 billion will be needed for training facilities and accommodation for fans and players. A further $45 billion will be allocated for developing Lusail City that is expected to accommodate 200,000 citizens. Finally, $50 billion is expected to be ploughed into upgrading transport infrastructure, including new rail and metro systems. With all that money sloshing around, is it any wonder FIFA were keen to award Qatar the World Cup. 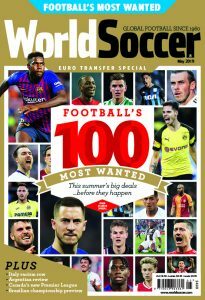 Jose Mourinho, who has spent a trifling €55 million strengthening his humble Real Madrid side this summer, believes he has been a model of restraint. “We did such a good job last season, so radical changes were not needed”, said the Portuguese coach. Mourinho also criticised those who had the temerity to note that last season was the first time he had not won a league title in his first year in charge of a club. Tomorrow, Mourinho on why black is the new white.